Making Compost Teas. See How to make Liquid Soluble Fertilizer from Manure, Comfrey and more. 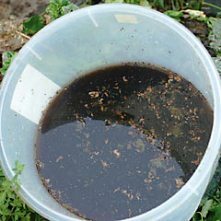 How to make compost tea and other soluble, liquid fertilizers from manure, comfrey, nettles and other herbs and weeds. There's nothing like a pick-me-up... a nice cuppa that is. How about making compost tea to perk up your plants. 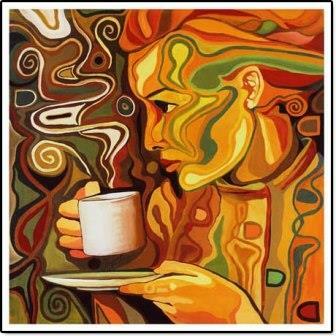 Many people simply wither without their regular cup of tea or coffee. Plants love refreshments too, especially a home-made liquid fertilizer. Watch your plants come alive like Jack's magic beanstalks with these home-made brews. There are numerous references to liquid fertilizers in this site. That is because virtually all vegetable plants do best when they grow quickly in a fertile environment. These recipes for organic liquid fertilizers are easy but effective. They will provide a valuable tonic brimming with minerals and nutrients to your plants and the soil. As a general guide, liquid feed your plants every 3 weeks during the growing season, or for heavy fruiting and fast growing veggies feed twice as often using a slightly weaker dilution. Compost and other plant teas are usually fed to the roots of your plants, simply water into the soil. Foliar feeding can also be done and the helpful microbes and bacteria in the tea aid in combating viruses, fungi, pests and diseases. For foliar feeding, grab an old shirt, curtain or piece of muslin to strain the tea before filling up your sprayer or watering can, then add a small squirt (approximately ½ teaspoon of detergent or vegetable oil per watering can (4 litres/1 gal)) to help the liquid adhere to the leaves. You will still need to add other materials such as compost and mulch each season to condition the soil, adjust the carbon/nitrogen ratio and depending on the materials used, possibly correct any imbalances of available nutrients to your plants. Yes, there are lots of plants and by-products used to make plant teas... read further below... and these guidelines for compost cover how to make most plant teas; but we'll start with actual compost. Use a large waterproof bucket, vat, tub or other container with a lid. A 4-5 litre (1gal) bucket, a 23 litre (5 gal) bucket, or a 45 litre (10 gal) rubbish/garbage bins are all good. A tap at the bottom is not absolutely necessary, but does make it easier to extract the liquid. If you haven't got a tap in your container, it's not difficult to buy a faucet and drill a hole and put one in or buy a ready-made container with dispenser. Especially when using a container with a tap, it can be helpful to put your ingredients in a sack before adding water, to stop any bits of solid blocking the way. Having a sack also makes it so easy to lift out and drain the rotten old lump of decayed mess. Fill your container half full of compost; including any plant matter that has not properly broken down to form compost yet. Top up with water and cover with lid. The lid does not need to seal; it just helps keep the strong smell more contained! After 3 weeks your compost tea will be ready to use diluted approximately 1:10, or the colour of weak tea. Leave it longer and keep topping it up during that growing season as you use it, or throw the mush on the garden and start again. If you can use top quality compost... and I mean perfect crumbly black gold with no traces of plant matter showing, yet not too old that it's dry and, well old... then you only need to steep for just a few days to a week. Leaving it longer is fine, but you can use it sooner if you need it. To make a truly aerobic tea supplying plenty of oxygen, you can buy an aerator from garden supply shop or fish and pet supply shop. Follow the instructions to set it up in your container and keep it bubbling away to produce your plant tea. Don't minimise the bubbles with an aquarium air stone and make sure the hose is kept down the bottom of your container under the tea material so that big bubbles boil to the surface. Aeration like this speeds up the process and helps form beneficial bacteria and microorganisms. In fact this aerobic tea is potent enough and ready to use even within a few days. Once you stop the aeration process use this tea asap whilst the microorganisms are alive and hearty as they soon die when their oxygen supply is gone. Many gardeners add a large spoonful of sulphured molasses as a sugar and micro mineral source. The idea is that this feeds the microorganisms, helps the fermentation and extraction of all the beneficial elements from the material. Another method is to simply do nothing and your compost or plant tea will be useful but not quite so potent because it will not have developed so many active microbes. Seaweed Tea is another useful and easy plant tea you can make. If you can collect some seaweed, rustle up a homemade brew; see Using Seaweed Fertilizer and Making Seaweed Tea. To make and use worm tea, follow the same principles as for making compost tea above. Use the worm castings obtained from your worm farm. There is also worm juice or leachate that is produced by worms. Read about Worm Composting here. Use a large bucket or other container. Fill the container half way with fresh or aged poultry manure and top up with water. Allow this to stand for 4 weeks minimum before using. Dilute by one pint fertilizer with two gallons of water (half a litre mixed with 10 litres of water). Other manures can be used, though poultry is prized most. Comfrey is often referred to as the 'miracle herb'. It is worth putting this herb in a corner of your garden for its myriad uses. It will grow in a wide variety of soil conditions and has a very deep root system . The deep root system — 20-30 feet if allowed, believe it or not — allows it to bring minerals and trace nutrients up into its leaves that are unavailable to other plants. It is also the only plant that contains a form of vitamin B12. Comfrey is a large plant with thick, furry leaves. 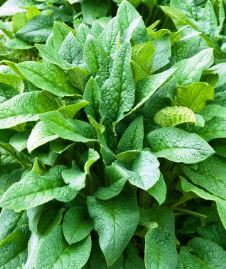 It can be used as a green fertiliser (chop up the leaves and place on the garden), as a compost activator, or as a liquid fertilizer 'comfrey tea'. As a soluble fertilizer, comfrey is mineral rich and in particular contains copper, so it is useful to spray on plants that might be susceptible to fungi and virus attacks. Use as a preventative foliar spray in winter... for example it's often used to combat leaf curl on fruit trees. Nearly fill your container with large comfrey leaves, broken or chopped up with clippers. Add water to the top and leave it for at least 2 weeks or more until the leaves rot down. Dilute 50/50 with water or use the rule of thumb guide of diluting to weak tea colour, and pour around the roots of your plants. For the next and most used method by millions of farmers and gardeners over the years, you need to use a container, mounted on a platform, with a tap in or near the bottom. Just put a good amount of chopped or broken comfrey leaves into container then put a heavy weight on top or lid that can press down on the pile of leaves. No need for the lid to fit or to seal the top. Don't add water and you'll soon realize the advantage of this method over watery methods of making compost tea... and that is almost no horrible smell! Depending on the weather, in about 2 weeks you will have a runny, black fermented comfrey porridge which you can trickle off and dilute with water. Use 1 part comfrey tea to 20 parts of water for container plants and young seedlings; and 1 to 10 for vigorous growing larger plants. Use fresh, but if you want to store some for later whilst you make another batch, keep your surplus in a jar or similar in a dark, cool place. A third way to make non-smelly comfrey tea is to use the press method as above but without needing a tap. Use a large plant pot or bucket with drainage hole(s) and fill with leaves then put a weight on top. Now put this container into a larger one with no holes, allowing space at the bottom between the two buckets for the slurry to collect. Nearly as good as comfrey tea, a liquid made by steeping nettles is another tried and true soluble fertilizer that is commonly brewed. Gather the nettle plants (with gloves!) and use any of the above methods to make and use your nettle tea. Popular herbs for making herbs teas — that's liquid plant fertilizer to help your garden grow — not for you to sit down on the job — are the likes of deep rooted parsley, borage, and yarrow. Follow any of the above methods. Weeds make a great plant tea — make use of your weeds; get your own back on them! Throw in different sorts from shallow rooted to deep rooted varieties, because each variety contributes different amounts of valuable minerals and factors. 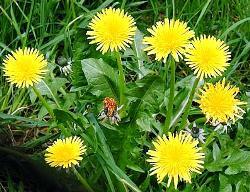 Some commonly used weeds, particularly noted for their deep roots to bring up minerals from way down, are dandelion, plantain and dock. But throw in some of the nasty creeping weeds like wandering willy and watch them turn into useful sludge! So now, not only can you make your own compost, you have the know-how for making compost teas to feed your veggie patch and garden. Here’s more food for thought. 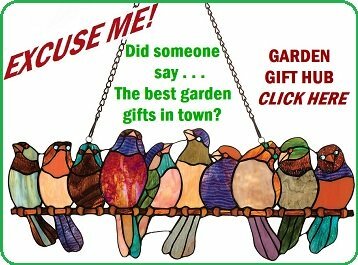 Have a read of Organic Garden Fertilizers. Some of these ways of helping your vegetables along are unproven, controversial and some are good basic, salt-of-the-earth, handy helpers... like me! Over to you.